Placing a VPN on your router is a quick way to hide your internet activity and shield your personal details from hackers and cyber thieves. VPNs for routers enable you to cover all of your home devices with just one VPN. Read on to learn how a VPN router works, how to set it up, and which are the 5 best VPNs for routers so that you can feel protected from every angle. When you go online, hackers, cyber-thieves, or the perennially curious can easily gather your IP (Internet Provider) address and use it to see what sites you visit online and even to steal your private details. If you’d like to protect your privacy, the best and easiest way is to use a VPN, or Virtual Private Network. A VPN hides your internet activity in a ‘tunnel’ and encrypts the signals that your computer sends to the server. You can set up a VPN on your computer easily, but you'll need to set up another one on your smartphone. And what about your smart home thermostat or wireless security system? With the advance of the Internet of Things, we have more home appliances that connect to the internet, each of them potentially hackable. The best way to secure all of your wireless-enabled devices is to install a VPN on your router. By protecting your router with a VPN, you can include every smart appliance and WiFi device within the same envelope of security by installing and configuring just one VPN. How Do I Setup a VPN for My Router? Setting up your VPN for router might seem daunting, but we can help you through it step-by-step. What is a WRT Router? WRT stands for Wireless RouTer, but you’ll usually find it talked about as DD-WRT. DD-WRT is a type of Linux-based firmware for routers that effectively reconfigures them. When you buy your router, it comes configured to be easy to use by the average customer, but that also restricts the ways you can use the router—including stopping you from turning it into a VPN router. DD-WRT lifts those restrictions, so you can use a DD-WRT router as a VPN router. What is a VPN Firewall Router? A VPN firewall router simply combines the benefits of a VPN, which encrypts your internet traffic, and a firewall, which protects your network from viruses, hackers, and other attacks on your router. A VPN firewall router is the best way to protect your privacy from every danger using both encryption and firewalls to keep out the risks of the internet. What Are the 5 Best VPNs for Router? ExpressVPN​ is one of the most popular choices for VPN for router. You can buy a pre-configured router through ExpressVPN to save time, or follow the very clear instructions that ExpressVPN provides for every type of router. ExpressVPN has strong 256-bit encryption which is compatible with Linux for your router as well as the standard Windows, Mac, iOS, and Android options. A kill switch, iPv6 and DNS leak protection, and a zero log policy add to the strength of ExpressVPN while over 1,700 servers across 90+ countries, unlimited bandwidth, and P2P file sharing and torrenting ensure that you’ll always be able to access fast internet that answers your every surfing need. Just in case you’re not satisfied, there’s a guaranteed hassle-free 30-day money-back guarantee. Setting up NordVPN​ for router is easy, especially since you can buy a VPN-enabled router at a discount through NordVPN and FlashRouters. NordVPN has the most servers worldwide of any VPN provider, with over 4,400 in 60+ countries. Although having VPN on your router can sometimes slow down your internet, this doesn’t happen with NordVPN, thanks to the 6 specialized servers that are optimized for P2P file sharing, torrenting, and gaming. NordVPN offers serious protection for all of your devices with double encryption, zero logs, and a kill switch. You can use one NordVPN subscription to connect up to 6 devices, so you can protect your smartphone, tablet, and laptop when you’re out and about, as well as your router. CyberGhost​ delivers a fast VPN for your router that won’t slow down your surfing and browsing while still keeping all of your home devices protected. CyberGhost stands out for offering the best free VPN for router. You’ll get access to around 30 servers with the free version, and although it’s limited to one device only, lower speeds, and just 3 hours use at a time, it’s still a great deal for $0. The paid version brings higher speeds and over 1,800 servers in addition to consistently reliable unblocking of geo-restrictions and military-grade encryption. Setup is easy when you buy a dedicated DD-WRT or Tomato router from FlashRouter that is pre-configured for CyberGhost VPN for router. ZenMate​’s VPN offers sturdy protection through your router and for other devices too when you’re out of the house. You can use it on up to 5 devices with one subscription and test drive it with a 7-day free trial. ZenMate protects your router with zero logs and high-level encryption while enabling torrenting, P2P file sharing, and fast gaming and browsing on every device. ZenMate has servers in over 30 countries to help you unblock content through your router. With PureVPN​ you can connect securely to the internet through your router and protect up to 4 other devices on the same subscription, which is ideal if you’ll be traveling. PureVPN is compatible with a wide range of routers, and they offer 24/7 support to help you configure your device. To make it easier, you can buy a PureVPN pre-configured router through FlashRouters. PureVPN fields over 500 servers across more than 140 countries to deliver fast internet that isn’t slowed down by the high level of encryption. You can try PureVPN for free without obligation under the 15-day money-back guarantee. Installing a VPN on your router is a one-stop way to make sure that every single smart item in your home is protected from hackers and cyber-snoopers. 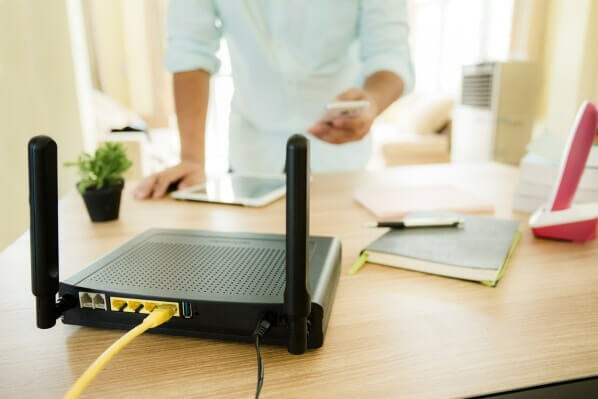 Choose any one of the 5 best router VPNs that we recommended here to keep your home fully secure, no matter which device you use.